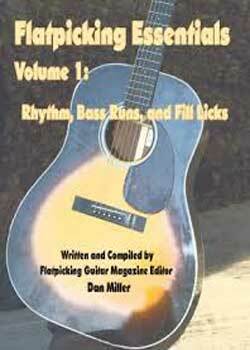 Flatpicking Essentials Volume 1: Rhythm, Bass Runs, and Fill Licks PDF. This 96-page spiral bound instructional book, with audio CD, teaches you how to play interesting and exciting rhythm guitar accompaniment by showing you how to fill the rhythm guitarist roles of: Keeping Good Time, Outlining the Chord, Leading the Listener’s Ear to the Chord Change, and adding Texture, Excitement, Drive, and Interest. The goal of this book and accompanying CD is to make you a better rhythm player, and to also prepare you to begin playing lead guitar in Volume 2 (Learning How to Solo: Carter Style Leads and Beyond). The Flatpicking Essentials instructional series is designed to teach you the art of flatpicking the acoustic guitar in a sequential, step-by-step method that will gradually build your flatpicking skill in a way that leaves no “gaps” or “holes.” While this method will be extremely beneficial to beginners, this series will also be of great value to those guitar players who have been working to learn how to flatpick for quite some time, yet can’t seem to get beyond a certain plateau. If you are having trouble moving beyond memorized solos, adding interest and variety to your rhythm playing, learning how to play up-the-neck, learning how to come up with your own arrangements to songs, learning how to play by ear, or learning how to improvise, then this series is for you! Download Dan Miller – Flatpicking Essentials Volume 1 PDF free and other books from our site. Only high quality PDF scans. Please write a review, it's important for our community.